Christianity already came into existence on the land of Azerbaijan in the first ages of A.D., when the first Christian missionaries from Jerusalem and Syria began to arrive in Caucasian Albania, the state situated on this land at that time. Afterwards on these lands arose the first Christian communities. St. Bartholomew, one of Christ`s twelve apostles, was the best-known of the preachers of the Gospel who had ever set foot on the land of Azerbaijan. He came from India, from which a great number of caravans consisting of pilgrims to the fire country travelled to Albania since Caucasian Albania was home of zoroastrism, the religion centered on the worship of fire. Under tradition, the Apostle was martyred by pagan priests infuriated with his successful sermon. However, the seeds of the Gospel had already fallen to the beneficial soil, and St. Bartholomew`s cause was continued. St. Eliseus, a disciple of the Apostle Thaddeus martyred in the neighbouring Armenia, was the second to introduce Christianity into that country. Eliseus made an apostolic journey about many parts of Albania, also visited Gis (present-day the village of Kish near the town of Sheki), where he had a church built. Up to now in this village there has been an ancient church reminding us of that event. Gregory the Illuminator, who converted Armenia to Christianity, also played a significant role in the conversion of Caucasian Albania to the Christian faith. When the king of Albania Urnayr heard of the miracles shown by St. Gregory, he escorted by his court and strong army started for Armenia to king Trdat, who had already adopted Christianity. According to the Albanian historian Moses of Kalankatuyk, after conversing with St. Gregory, Urnayr repented his paganism and acknowledged the risen Son of God. Then all his army and he himself kept the forty-day fast. On finishing the fast they were baptized, thus, in 313 Christianity became state religion of Caucasian Albania. It would be interesting to know that in the narrative of Urnayr`s baptism the very Moses of Kalankatuyk mentioned a certain blessed man ordained bishop in the city of Rome, St. Gregory sent him to Albania together with the converted King, but there is not any further information of the bishop. The Albanian Church had hard times throughout her existence, after 451 she together with the Armenian Church adhered to Chalkidona schism, suffered from Moslem expansion, but existed up to 1836, when the new owner of Azerbaijan lands, the Russian Empire, cancelled her independence and joined her to the Armenian Church. From the beginning of the fourteenth century Catholicism began spreading in Azerbaijan thanks to efforts of numerous missions of Dominicans, Franciscans, Carmelites, Augustinians; abbeys, missions and schools were founded there. At the same time Catholic missions often met with the opposition of Moslem inhabitants and representatives of the Armenian Church, who regarded them as competitors. In 1320 the French missionary Zhurden Catali de Severak and a little later The Franciscan Odorik Pordenonsky visited Baku and other Azerbaijan towns. It was at that time that many Catholic missions and monasteries appeared here. Only in Nakhichevan of that time there were 12 Catholic monasteries. The second half of the 19th and the beginning of the 20th century was an important stage in the life of the Catholic Church in Azerbaijan. At that time a lot of foreigners who accepted Christianity different from the Greek Russian Orthodoxy arrived in Azerbaijan. Among them there were a lot of Catholics. The oil boom and the exile of Polish unrising participants were reasons for their arriving in Baku. By 1880 more than a thousand Catholics had already resided in Baku. The Community organized by them started insisting on the permission from the authorities to build a church as Holy Masses had to be celebrated in different premises rented by believers. It was a difficult task since the authorities prevented them. Various plausible excuses were invented to forbid the construction, for example one of them was the territorial limitation of donations: a church was allowed to build only on the money collected in Baku province. However despite the bureaucratism, which slowed down work, the Catholic Community was increasing. By 1903, when the number of Catholics mounted to ten thousand people, the bureaucratic obstacles had been overcome, and in May 1909 the solems (ceremonial) laying of the foundation- stone took place. The Church of Mary`s Immaculate Conception was on the crossing between Rashid Beybutov street and Azerbaijan avenue. It seated 1200 churchgoers. In 1931 the Church was blown up by Bolsheviks and on its place was built the club-house after Jerzhinsky (present-day Shakhriyar Palace). Nevertheless, Father Stephan Demiurov, the dean of the Parish, secretly went on celebrating Holy Masses for parishioners. However, in 1937 he was arrested and executed by firing squad. The revival of the Community in Baku was started in 1992, when a few believers wrote a letter to the Vatican, making a request for a priest to be sent out to celebrate Masses. In 1996 and 1997 the Secretary of the Holy See embassy in Tbilisi Timon Titus Khmeletski visited Baku several times and met people interested in restoring the Catholic Community. The Holy See considered the possibility of the Jesuits Order Monks`arriving in Baku. However, all the priests of the Order were busy at that time, none of them could come to Azerbaijan and therefore the idea had to be refused. July 21, 1997 the Apostolic Nuncio Zhan Pol Gabel and the Apostolic Administrator of the Caucasus Juzeppe Pazotto visited Baku together with the priest of Zamoysko-Lobachevsk diocese, Father Ezhi Pilys, who received his bishop`s permission to begin working in Azerbaijan. The attempt to organize the Community registered officially, originally met with lack of understanding from the Republic authorities. They considered the Catholic parish to be needless because, in their opinion, Azerbaijan had no Catholics therefore did not need it. At first Father Ezhi Pilys celebrated Holy Masses in a private apartment and several Catholics from foreign countries working in Baku visited them. Afterwards, in November of the same year, another attempt to register a parish was made, but it failed as well. The Catholic Community did not have a Charter, the presence of which was an innovation in the registration procedure. A young lawyer with Catholic parentage helped to resolve this, in December the definitive wording of the Charter was delivered to the Representative of the Holy See in Tbilisi for acquaintance and recommendations. At the same time Father Ezhi went on working with zeal in Baku. He was looking for people who visited the old Catholic Church destroyed by Bolsheviks, their children and other relatives who remained loyal to the Catholic faith. The Community was increasing; more and more Baku inhabitants and foreigners began visiting Holy Masses. The attempts to register a parish constantly took place despite all the bureaucratic obstacles by officials of the Committee for Religious Affairs. The high representatives of the Holy See working in Transcausasia rendered assistance, arranged official meetings with the authorities and the Moslem priesthood and about a year later, April 2, 1999 the Baku Catholic Comminity was officially registered. In February 2000 Father Daniel Pravda, a Salesian monk, arrived in Baku to explore the situation and the possibilities of his brethren`s coming. He came to our country several times, and during his second visit he took an active part in searching for a parish home. At last a small private residence in the hippodrome area was chosen by him. In April of the same year the Community bought the residence and the means were provided by Salesians. The residence was then repaired; a chapel for Masses, priests and monks` rooms in this residence were fitted out and sanctified. October 11, 2000 the Congregation for the Evangelization of Peoples appointed Don Bosco`s Salesians (SDB) to be responsible for the mission in Azerbaijan. Father Daniel became Superior of Missio Sui Iuris in our country and soon a few more monks from Slovakia arrived in Azerbaijan. The Salesians organized a charity canteen for the needy, opened Maryam School for children and teenagers. More and more people began to be interested in the Catholic faith and visit Holy Masses. 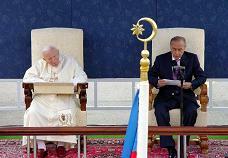 In May 2002 an important event happened in Azerbaijan: Pope John Paul II was on an official visit to Baku. May 23, 2002 the Holy Father`s plane landed at Bina airport and Azerbaijan’s President Geydar Aliev met the distinguished guest. On the second day of his visit, after many official ceremonies and meetings the Pope celebrated a Holy Mass in the Palace for Indoor Games where thousands of people gathered to see him. The importance of that visit can scarcely be exaggerated. The Catholic Comminity stopped being regarded as a Christian sect. The number of people who were interested in Christianity and the Catholic doctrine had greatly increased, the relations with Azerbaijan`s authorities improved, as did bureaucratism of bodies working with religious organizations to a large extent. President Geydar Aliev gifted the Community a plot of land to build a new Church instead of the Church destroyed by Bolsheviks. The Church named in honour of the Virgin Mary`s Immaculate Conception was built in February 2007. In June 2003 Fr. Daniel Pravda resigned his commission of Siu Iuris Superior. This position was filled by Fr. Jan Chapla who came to Baku from Slovakia on the 18th of the same month. He has headed the Catholic Community up to the present. In January 2006 Mother Teresa`s Missionaries of Charity .started operating in Baku and June of the same year Mother Teresa`s Sisters opened a home for the homeless in the settlement of Zikh.